Since the sock is stretched after stuffed, thick sock with close-knit yields better quality than thin sock. Click here to shop for Microfiber chenille socks set in Christmas Theme to make Sock Reindeer. Due to it’s weaving process, chenille socks will tend to have holes. If this happened to your, just stitch up to mend the hole, the fussy fiber will cover up the stitches. Always massage the stuffed parts to loosen up the lumps. Roll the long cylindrical parts with both hands to smooth out the lumps, it will also help to make the parts longer and firmer too. 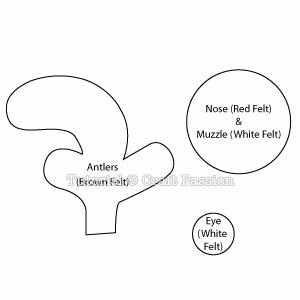 Download the template of Reindeer: Antlers, Nose & Eyes, print it out on a card or paper without any scaling (counter-check the 2″ scale indicator on the template sheet). Gather all the materials and tools as listed above. Always pre-wash the socks before sewing them into sock toy. Trace the templates onto the respective felts: Antlers on brown felt; Nose on red felt; Muzzle and Eyes on white felt. 1. Stack both brown felt together and align, sew 1/8″ inside the tracing lines with matching brown thread. Do not sew the bottom edge of the antler. Cut the felt along the tracing lines, no seam allowance needed. 2. Stuff the antlers with poly-fill stuffing through the small opening that we didn’t sew up. Use a pair of blunt tip tweezers to stuff. Set aside. 3. Use the cap of the marker to draw a half circle on the white felt to make a smiling lip. 4. Embroidery it with yellow embroidery floss. Set aside. 1. Sew a running stitch around the edge of the red circle felt with red thread. 2. Pull tight to gather the edge. Knot it securely. 3 & 4. Stuff the nose with poly-fill stuffing. Stuff real hard to make a firm round nose. Set aside. Cut the heel gusset (the triangle piece) from the socks. Trash it or keep it for other project. Cut the foot part (x + x’) from the socks, cut it into halve on both plain socks and chenille socks. x is for reindeer’s head, x’ on plain sock is for reindeer’s legs, x’ on chenille sock is for reindeer’s arms. The whole leg part of chenille sock is for the body of reindeer. On the Plain sock, cut about 1 1/2″ from the leg part, y, this is for reindeer’s arms. The ribbing area, z, is for the reindeer’s ears and tail. Refer to the picture for better illustration. Pair the arms part and legs part of the plain sock to the chenille sock. Turn the plain sock with wrong side facing out, insert the chenille sock into the plain sock, align the raw edges. Check: The socks must be facing each other on the right side. Sew the aligned edges with sewing machine, with a seam allowance of 1/4″. Flatten the arm part, leg part and ears-tail part with wrong side facing out, align the seam lines of both layers and pin them together. For stripes socks, align the stripes on both layers and pin, this will give a better stripe alignment at the seam line. Draw the outline for the legs, arms, ears and tail on the sock. Get larger picture here. Sew along the drawing lines. The join of the plain-chenille is thick to sew, sew slowly and carefully, use an awl to press the chenille sock down to reduce the thickness so that it is easier for the presser foot to get over. Remember to pull the sock slightly while sewing. 1. Cut all pieces out with at least 1/8″ seam allowance. 2. Turn all pieces with right side facing out. 3. Stuff body until it is firmed at the leg part and gradually reduce the firmness towards to the top. Stuff arms until the beige part is firmed, add a little poly-stuffing material to the chenille sock part. Stuff the tail firmly. Set aside. 1. Stuff the head part of the plain sock with poly-fill stuffing material until it is about the size of a fist. 2. Sew running stitch 1/4″ from the edge, pull to close the opening. Push the raw edges into the head. It is alright if the gap is not completely closed. 3. Roll the head until it is round and smooth. 4. Insert the plain sock ball into the red stripes chenille sock. Fold up the raw edge of the chenille sock and stitch to the beige sock ball. Make sure the raw edge is caught in the thread so that it won’t stray out from the head. 1. Make the ear indentation on the side of the head, slightly higher than mid length of the head, as shown. 2, 3 & 4. Use 4 strands of thread, make a few stitch across the head to the opposite and pull to create the dent. The head will turn into an oval shape. Stitch the dome-shaped button eyes and white eye felt to the head, near to the chenille hood, on the same level of the ear indentation. First, you sew to attach 1 eye, knot. Insert the needle back to the face and come out from another eye marking, pull to sunken the first eye and indent the second eye placement, knot. Sew the second eye at the indentation, knot then bring the needle out from the first eye, knot again. 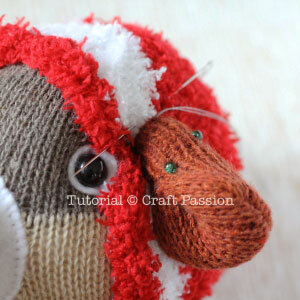 Place the white muzzle felt of the face and stitch along the edges with white sewing thread. Stuff some poly-fill into the muzzle to give it a body before finishing up with the rest of the sewing. Sew to attach the red round nose on the top of the muzzle. Next, we are going to sew the ears and antlers on the reindeer. Since I am using the elastic ribbing part of the sock for the ears, I pull out all the elastic thread and removed them from the socks but this is absolutely optional. 1. This is how I secure the knot so that the knot won’t escape form the knits of the socks. 2. Sew to close the opening of the ears. 3. Fold the ears to half and sew along the base and half on the side. 4. Pull to shape the ear. Repeat to make 2 ears. Place the ears on the indentation position, with the ears pointing down, pin and sew around. Repeat the same to the other ears. Eyeballing the position and pointing direction of the ears so that they come out to be identical. Position and pin the antlers on the head of the reindeer. Stitch around firmly. Make sure your stitches go further into the head and catch the plain sock part. 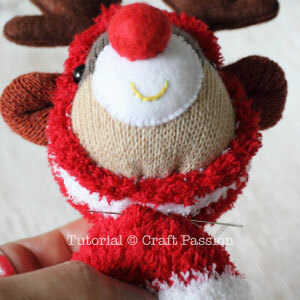 If you sew the antlers to the chenille socks only, they won’t stay firm for long. Next, we are going to do the final assembly to attach the head to the body, arms and tail. Sew to close all the openings of the body and the arms. 1. Give them a good roll by using your both hands to compress and roll, just like when you are rolling a dough into cylindrical shape. 2. Arms: Right – Before, Left – After. Stitch the body to the bottom of the head. At this point of progress, you will feel that the head is a bit weak and will not stand upright very well without support. Sew the arms at both side between the head and the body. Sew around, sew the top of the arm to the head and sew the armpit to the body. Repeat the same to the other arms. After both arms are attached, the body will now hold up the head properly. Turn to the back of the reindeer and sew the tail. Tie a jingle bell to the neck with a string of yarn. Hello, I am Stripy Red the Reindeer. I was born in 2015 from the creator of Craft Passion, Joanne.L. I am ready to send happiness and merriness to the world during the festive season. Please duplicate us and stuff us into the Christmas stocking, the kids will love you and me forever. My flock of Reindeer wish to say “Merry Christmas” to all of you here! Now, we are waiting for Santa Claus’s sleigh to arrive and HO HO HO, we could fly on the sky to send out the happy goodies. La vol 2016 est annoncé!